JOURNALISM seems to be a very popular subject with cinema these days. May be Watergate in 1972 set the trend and in the last two decades there have been a plethora of films with journalists as the focal point. The ones that readily come to mind are Network, Deathwatch, and Broadcast News, most of them dealing with TV journalism. I think at one time in the 1980s every fourth film made by Hollywood had a journalist in it. The latest in the line is The Insider and what a powerful one it is. For drama you need a guy like Al Pacino with his "f"s flying around, but it is also very realistic and is based on a true story of how a tobacco company played havoc with a TV network and how a strong, straightforward journalist stood alone against the system. 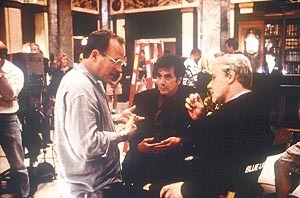 It could well be called "A Day in the life of a Journalist" and director Michael Mann of Miami Vice fame, has worked wonders with the subject. Jeffrey Wigand (Russell Crowe) was a central witness in the law suits filed by Mississippi and 49 other states against the tobacco industry which was eventually settled for $ 246 billion. Wigand, former head of research and development and a corporate officer at Brown & Williamson, was a top scientist, the ultimate insider. No one like him had ever gone public before. Meanwhile, Lowell Bergman (Al Pacino), investigative reporter and 60 Minutes producer, mostly for Mike Wallace (Christopher Plummer) segments, taped the famous Wigand interview with its devastating statements, and arranged a legal defence team for Wigand. However, before the most newsworthy 60 Minutes segment in years could go on air, Bergman would lose to a CBS corporate decision to kill it, showing the power of certain lobbies (the tobacco lobby here) to bulldoze their way in the system because of their money power. "Were in the nicotine delivery business... light it up and you gonna get your fix," is one of the lines in the film. It is all about the addictive powers of nicotine and how the CEOs hide much of the truth from the real world. What happens to the "ultimate insider" Jeffrey Wigand after he decides to expose the tobacco company is what the film is all about. From the start it is obvious that Wigand is the focal point. And the pace is different. More laid back. More European than Hollywood. The camera focus, the slow-motion shots all point out to this. It is the right build up. How does his family take it ? "Weve got two kids, one is hers, one is mine, everybody uses different names, modern family," is a nice way of describing things. How does the wife (Diana Venora) react to all this ? It is a case of ordinary people reacting under extraordinary pressure. But what about the journalism aspect. How can a programme like 60 Minutes which prides itself as being the paragon of investigative journalism allow its legal department to hold the story ? What about the role of anchor Mike Wallace ? Just because he has been on the show for years should he be ready to compromise ? And then you have the fearless, upright journalist Lowell Bergman willing to sacrifice everything for his conviction. It is a dying breed but Lowell sticks to his principles and fights the tobacco lobby tooth and nail. At the bottom rung of the ladder one is not particular of the colour of the money one earns, but when one is higher up, near the top, isnt one responsible for the integrity of ones work ? Another point the film raises is  which is the key section of a newspaper office, the editorial or the management, which means the advertising and the marketing ? Who calls the shots. And what are the vested interests ? That Wigand becomes the victim of a smear campaign is not surprising. The tobacco lobby digs dirt from his past and tries to malign him. But it is Lowell who sticks to him through thick and through thin. If Pacino had a mission in Scent of a Woman he has another here and he delivers it with the gusto we are used to seeing him display. There are spurts of high drama. But it is Russell Crowe, seen earlier in LA Confidential who goes through a whole gamut of emotions, who steals the march over Pacino and that is because of the nature of his role. It is a psychological profile done with utmost care and the right pacing. Christopher Plummer does well as the despicable anchor always on the winning side but it is the all-round depiction of the ruthless, dog-eat-dog world of journalism, the electronic part of it, that is so succinctly portrayed. It may be a bit dramatised but the core is unblemished. A must-see for all.